19 January 2014 by Bulent Selcuk. Demotix. 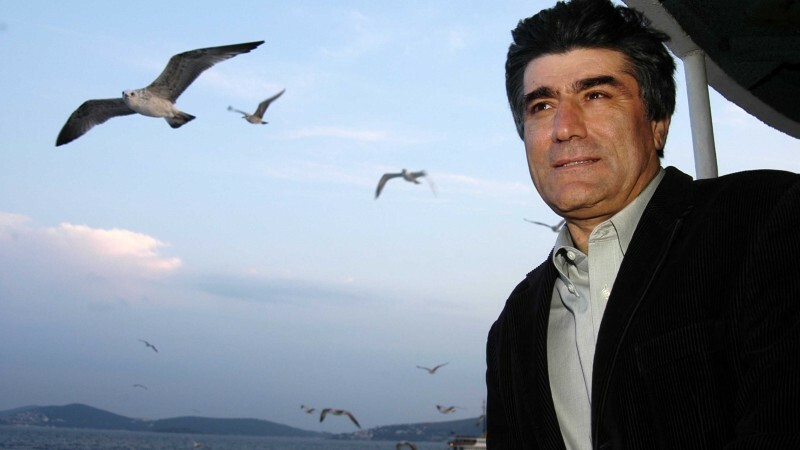 On January 19, 2007, Hrant Dink, an Armenian journalist, was murdered by 17-year-old Ogün Samast, an ultra-nationalist from the Turkish city of Trabzon. After a trial spanning half a decade, Samast was sentenced to nearly 23 years in jail in 2011. Dink was viewed by many as a leader of the Armenian community in Turkey, that pressed for a recognition of the 1915 Armenian Genocide, while also being a proud citizen of Turkey. Supporters of Dink, who edited the bilingual Turkish-Armenian newspaper Agos, believe that the murder was an organized act, which included officials in the upper echelons of the government. In order to answer these claims, another trial was held in Istanbul lasting five years. Despite all the evidence compiled by Dink's legal team, only one other man faced an aggravated life sentence for soliciting the murder, while 19 suspects were acquitted of being members of a terrorist organization. The verdict was met by public outcry as the Turkish state was once again shown incapable of shining a light on political murders. In May 2013, the Istanbul court's verdict was found to be unsatisfactory by Turkey's Supreme Court of Appeals in Ankara. This court argued that the government had bungled and eliminated evidence that could lead to the arrest of officials, and ordered a retrial. The idea that nationalism is welcome in Turkey is nothing new, but, the initial arrest of Ogün Samast was a particularly ugly sort of confirmation of its pervasiveness: when taken back to the station after being detained Samast posed for photos with police officers and a Turkish flag. Ogün Samast, assasin of Hrant Dink, and police taking a picture in front of the Turkish flag after his arrest in Samsun, 2007. Widely shared. The five years following this arrest witnessed false statements from different state officials, disappeared evidence, and a reluctance on the part of officials to question and punish highly ranked officials. Ogün Samast ve birkaç arkadaşı beş yıl boyunca yargılandılar. Hrant Dink’in arkadaşları ve avukatları, katillerin devlet içindeki azmettiricilerini, ilişkilerini, cinayeti örgütleyen devlet ve polis görevlilerini ortaya çıkartmak için beş yıl boyunca büyük çaba gösterdiler. Buna karşılık, Hrant Dink davasının savcıları ve mahkeme de, cinayeti sadece yargılananlarla kısıtlı tutmak için büyük çaba gösterdi. Örneğin, “Ergenekon” davası, “çeşitli bağlantıları bulmak” adına azami ölçüde genişletilir ve bu davaya, hükümete muhalif herkes sokulurken, Hrant Dink davası, çok bilinçli bir çabayla, sadece yargılananlarla kısıtlı tutuldu, ayan beyan ortaya çıkan bağlantılara gidilmesi bizzat mahkemenin kararlarıyla engellendi. Ogün Samast and couple of his friends were on trial for five years. Hrant Dink's friends and lawyers made an enormous effort to reveal the instigators of the murder inside the state, their relationship [to the killing], and the identities of the state and police officials who organized the murder. Yet, both public prosecutors and the court itself tried very hard to limit the case to people that had already stood trial. For example, while the ‘Ergenekon case’ was widened to the maximum in the name of ‘finding various connections’ and [targeting] everyone opposed to the government, the Hrant Dink case, was, with a conscious effort, limited only to the already prosecuted, and the court decision itself obstructed anyone wanting to follow the obvious connections. 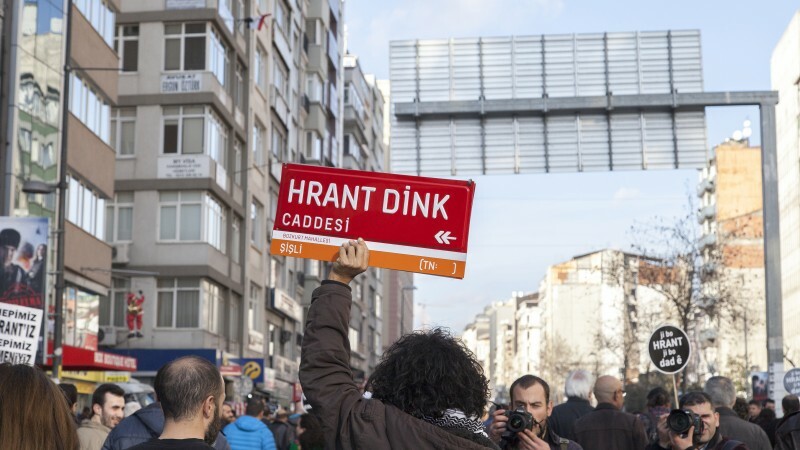 Nationalist sentiment surrounding the Hrant Dink case has been visible on the street as well as in the courtroom. The day after his commemoration last year, the website of Dink's Agos newspaper was hacked by nationalists who superimposed Mustafa Kemal Atatürk, a powerful symbol of Turkish homogeneity. Police officiating the 2014 commemoration ceremony wore white berets, similar to the one Ogün Samast had worn the day he murdered Hrant Dink. This year hateful tweets appeared glorifying the murder and congratulating Samast. January 19, 2014, Hrant Dink's commemoration. Police wearing white berets. Widely shared. Hopes for justice, or just more political retributions? The retrial has offered hope that important state officials might face prosecution. So far Istanbul city's then-commissioner Celalettin Cerrah, deputy governor Erol Güngör, and the intelligence chief of Istanbul's police intelligence unit at the time of Dink's murder, Ahmet İlhan Güler, have all been summoned to court to testify. On the day of Dink's commemoration this year, Commisioner of Cizre Ercan Demir, also turned himself in in Ankara. But many fear the government is now using the retrial to prosecute members of the so-called ‘parallel state‘ Turkish President Recep Tayyip Erdoğan believes is being supported by US-based scholar and acrimonious political rival Fethullah Gülen, and support a purge of the government. 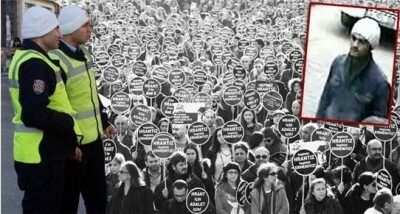 #HrantDink katil`in “cemaat” demeye getiriyorlar 12 yillik AKP zulmu “cemaat” ile yikanmaya calisiliyor yersen. They are trying to say that #HrantDink's murderer is “cemaat”. They are trying to wash away 12 years long AKP tyranny with “cemaat”. If you buy it. Agos's headline for tomorrow [“This Case Does Not Fit with ‘Parallel’-2″) Anyone disagrees? Başta cumhurbaşkanı, bu hükümetin özellikle unutturmaya çalıştığı bir hakikati hatırlamanın tam da yeri burası: Cemaat'in silahlı bürokratları bu işleri yaparken, şimdiki gibi, hükümetle kavga halindeki bir “paralel yapı”nın elemanları saymıyorlardı kendilerini. Hükümet de onlara kendi adamları gözüyle bakıyordu. It is time for me to remind the whole government, especially the president, of a truth they are trying to make us forget: While [Gülen's] armed bureaucrats were acting at the time, unlike today, they did not consider themselves as members of a ‘parallel organization’ in conflict with the government. Government [at the time] perceived them as its own men as well. January 19, 2015 is the eighth year since Hrant Dink's death, while 2015 marks the 100th year of Armenian genocide. Like the previous years, the walk started from Taksim and ended in front of Agos, where he was murdered. Thousands have gathered at his commemoration and demanded justice for his murder and recognition of the Armenian genocide. As was the case last year, people have come together under the hashtags #HrantIcinAdaletIcın (For Hrant, for Justice), #FasizmeInatKardesimsinHrant (You are my brother in spite of fascism), #BuradayızAhparig (We are here my brother) and #HrantDink.